Mrs Earth-Prime and I went to see Rogue One yesterday and while it’s fair to say I’m the bigger fan of the franchise as a whole, this is probably the first Star Wars film that she enjoyed more than me. I’ll be upfront – I enjoyed it on the whole, but it didn’t set my heart a’flutter like The Force Awakens did last year. For anyone who’s been living under a rock for the last year or so, Rogue One is the story of how the Rebel Alliance came into possession of the plans for the original Death Star and, by and large, it works. One of the main scientists/architects has sympathies with the Rebellion and tells his daughter, Jyn Erso, he’s built in a flaw without the Empire knowing. All Jyn has to do is convince the Rebels that he’s telling the truth, find the plans and get them to the Alliance without the Empire realising what the weakness is. Jyn eventually leads a daring attack against the data storage facility where the plans are held and (not really a spoiler) gets them to the Rebels. And that’s pretty much it. There are plenty of nods to the original Star Wars – everything from a CGI Grand Moff Tarkin, to Darth Vader (who’s hanging out on Mustafar which, oddly, is the only planet not to get an on screen title, unless I missed it), to the two thugs from the Cantina that pick on Luke, to a jug of blue milk, and many more – not forgetting the apparently obligatory cameo of C-3P0 and R2-D2. 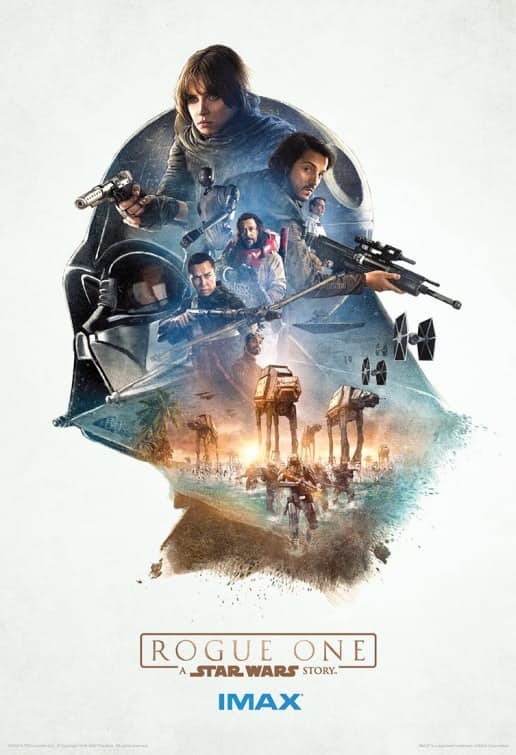 The film romps along with Jyn picking up compatriots who aren’t really introduced until they all band together to go and get the plans, all the while being chased by the Empire, and that’s probably my biggest criticism of the film. Jyn and her eventual partner Cassian Andor, are the characters who are the most developed, but even that’s done with broad strokes. Pretty much every other character are one note presences who turn up to do something and are then cast aside – you don’t really get to know any of them and so don’t really care too much when they inevitably die. Aside from Jyn and Cassian, perhaps the only exception is the re-programmed Imperial droid K-2SO, who is wonderfully sarcastic throughout. That said, the final beach fight and the race against time to get the plans out and to the rebels works nicely, tying the film tightly to A New Hope; indeed, the latter could be said to start within minutes of the end of Rogue One. And it was those last scenes, particularly Vader arriving to try and prevent the plans escaping, that proved the most exhilarating for me. As I wasn’t invested in Jyn or Cassian or any of the others, it was seeing this story dovetail with the original that made me grin the most. All in all, it wasn’t bad, but it wasn’t brilliant either. I don’t usually score the films I watch, but this one gets three Death Stars out of five. Posted on Monday, December 19, 2016 Sunday, December 18, 2016 by GaryPosted in Film/TVTagged Star Wars. Previous Previous post: Who Legos The Watchmen?